A table, whose covering appears to have been folded back, becomes the space for an arrangement of flowers in a vase and a beaded necklace in a ceramic dish. Cool blues, grays, and burgundys predominate. The flat picture plane, absence of background space, and diagonal (even tilted) lines combine create an unstable space--the Blue Beads seem to be spilling out of the dish. About the Artist: Born in St. Louis, MO, Harris moved to New York in 1920 and studied at the Art Students League with Max Weber. There he met other students with whom he would collaborate in the years ahead, eventually exhibiting along with Mark Rothko, Milton Avery, and others at a 1928 show at Opportunity Galleries. In 1934 Harris joined the new Secession Gallery, then left a year later to co-found "The Ten", a collective of expressionist painters upholding abstract art at a time when the Whitney Museum was shifting its emphasis to social realism. They argued that their mission was “a protest against the reputed equivalence of American painting and literal painting... [instead seeing] objects and events as though for the first time, free from the accretions of habit and divorced from the conventions of a thousand years of painting.” The group, which also included Rothko, Lou Schanker, Adolph Gottlieb, and Ben-Zion, held group shows between 1935-39. At their final show, NDG artist David Burliuk was included. Harris’s painting “Water Tanks” was selected for a 1938 FAP exhibit on Long Island, focused upon farms and rural life; fellow NDG artists Bena Frank, Herman Copen, and Tomizo “Thomas” Nagai also appeared. 3 works at Kemper Art Museum. 1 work at Rose Art Museum. 2 more images at FAP. His papers are at Syracuse University. 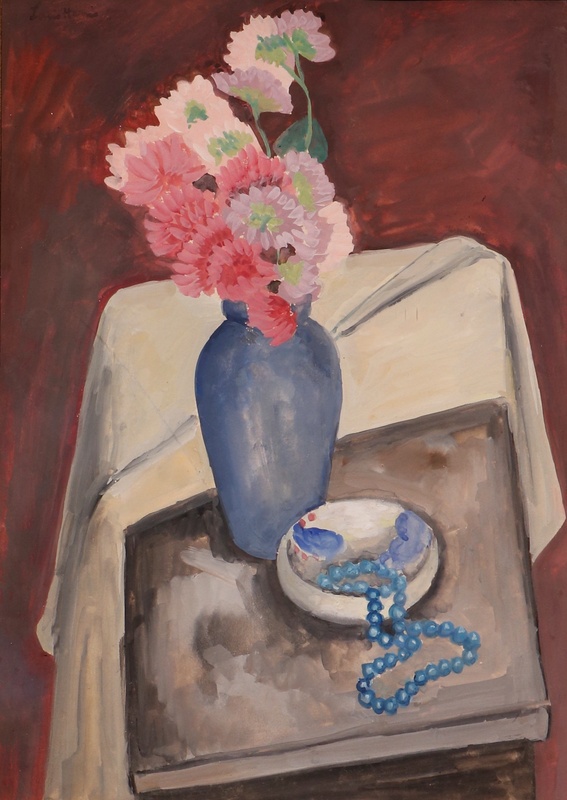 Harris, Louis, 1902-1970, “The Blue Beads,” OpenValley, accessed April 22, 2019, https://openvalley.org/items/show/998.